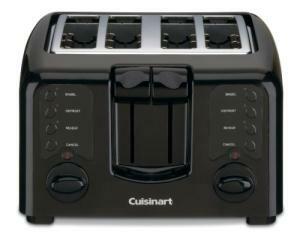 Cuisinart, the company that began with the food processor, now has quite an extensive line of toasters. Their offerings range from high-end stainless steel to the colorful Cool Touch models. This toaster is meant to be used where counter space is at a premium, and is very compact for a 4-slice model. The controls are intuitive yet extensive. As with any toaster you can choose between toasting two or four slices. With this model, in addition to dual plungers, you have a full set of toast settings for each side. For instance, you can toast bagels on the left while defrosting frozen pastries on the right. If you and your spouse each like toast done to a different darkness setting, you need only remember the side set with your favorite for consistent crunchy satisfaction. The unit has nine toast settings controlled by a dial and LED display, so you should not have any trouble finding the right one for the job. Extra-wide slots are able to accommodate bagels, and the bagel setting assures that only one side will brown. With the extra lift feature, you can grab hold of smaller slices without resorting to the fork-in-toaster hazard. While attractive and certainly shiny and feature-packed, this toaster has received mixed reviews since its release. Many complain that it simply doesn't toast both side of the bread consistently. All the settings in the world won't help if your toaster fails at this basic function. Be sure to scope out all the models in your price and feature range before purchasing. And if you need a slicer to prep your bagels beforehand, this Larien Bagel Biter will work just fine.